This book is now something of a modern classic. Read by Jeremy Irons, it makes gorgeous listening to take us into the winter months. 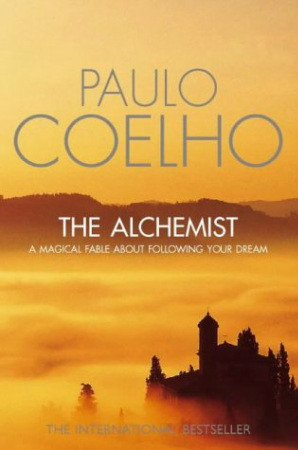 In the introduction to the novel THE ALCHEMIST, Paulo Coehlo writes "whenever we do something with enthusiasm, we are following our legend. However, we don't all have the courage to confront our own dream. Why? There are four obstacles." He then goes on to discuss them. However, Coehlo concludes, that if we believe ourselves worthy of the thing we fought so hard to get, then we become instruments of God, we help the soul of the world and understand why we are here. This enchanting fable is a story about the transformative power of following our dreams. THE ALCHEMIST, follows the story of a shepherd boy named Santiago who believes a recurring dream to be prophetic and so decides to travel to a gypsy in a nearby town to discover its meaning. Along the way, he encounters love, danger, opportunity, disaster and learns a lot about himself and the ways of the world. The book's main theme is about finding one's self destiny, one's personal legend. THE ALCHEMIST is global phenomenon, and according to Agence France-Presse (AFP) , it has sold more than 65 million copies in more than 160 countries, becoming one of the best selling books in history and winning the Guinness World Record for most translated book by a living author. BUY NOW Here on Earth (Unabridged) In this first-rate "tape turner" Hoffman once again proves her powers as a storyteller. Dialogue rings remarkably true in this reading by Susan Ericksen, which also brings out the incisive details and keen observations on nature, both human and otherwise, that Hoffman carefully deploys in this masterful narrative.